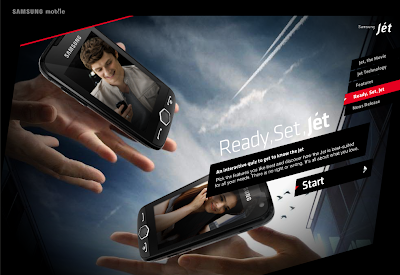 I like the website launched by Samsung to promote its latest Jet mobile phone model. Ready, Set, Jet is an interactive test that makes you discover the phone features. Good sound design, good pace, nice visuals. Check out out. The Samsung Jet is a very eye catching phone. The touch screen is simple and at the same time stylish. The speed is fantastic and the performance by this phone is very good. The sound quality is very satisfying. The design is very appealing to the eyes. I like the slimmer look. Youth will definitely love this phone.